From I-80, take exit 432 and go North on SR-31. In .3 miles, turn left onto Hwy-6. Go about 5 miles and turn right onto County Road A (SR-63). Almost immediately, stay to the right onto Nebraska Ave. This will take you to the main gate. SIGN IN with the gate guards for the campground. Continue past the main gate about 350 yards to Infantry Road. Turn right and stay to the right. This will take you into the campground. Reservations are required. Military training has first priority. None available at the campground. Training takes priority over visitors. Prices are for 30 or more nights, 6-29 nights, and 6 nights or less. 14 day stay limit. There is a water filling station available. No dump available. Only porta-potties available for restrooms. Buildings 55 and 508 are the ONLY buildings open to base visitors. Rowboats and canoes allowed on the lake - no motors. Swimming is allowed, at your own risk. No personal firearms, including BB guns, are allowed. 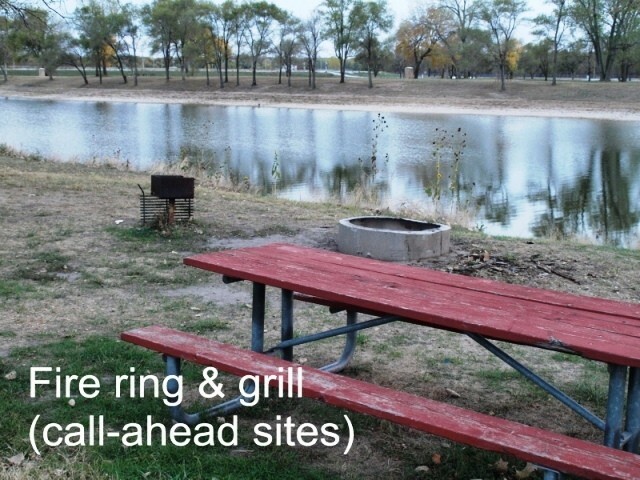 Small and quiet campground with few amenities located at Camp Ashland National Guard Base, NE. Near the Platt River. Camp Ashland has started charging $3/night. The reason they have started charging is they have added 30/50 amp service to most sights. Fishing on the pond will resume in 2019. The pond was restocked with bluegill and they are allowing the fish to grow prior to fishing. Water is available to fill your fresh water tank but you will have to go somewhere else to dump grey/black water. Porta Johns and dumpsters are kept clean. Very good thing that it is free...$5.00 would be too much to pay. Not unheard of to make a reservation and show up to find no key available. Makes for a nice weekend. For free I guess can't complain much. Ok. Here's the scoop. Camping is free. There's 15A (110 volt) service only at the pads that have E. Call the chief warrant officer at 402-309-7267 m-f 8a to 3p Central time for free limited hook ups (110v and water) you can't stay hooked up unless you get permission, but hey, if you have a splitter and a long hose..it's not like you are keeping others from water! I'm just sayin. He will email you a "packet" of information which includes your arrival & departure date,site number, map, rules, etc. You have to tell him if you want electricity and water..he'll put you in and around those areas. If not, it's dry camping and no need to call ahead. FYI. When you arrive, the gate guard will give you a binder with key if you choose the electric/water sites because they have chains on the site. The packet mostly pertains to cabins because they have them and charge for use plus 5.5% tax. Rv camping is 100% FREE, Electric or not! Just remember that while reading. We stayed overnight. We had called to check availability several weeks ahead of our scheduled arrival and the Sgt at billeting gave us a reservation. There was no charge for our pad which had an electrical hookup but no water hookup. The pad next to us had both and we probably could have run a hose to a second faucet at that site if we had wanted to and had a long enough hose. We did not have a fire ring or grill stand at our site although there was a large wheel that probably served as a fire ring. The literature we got on arrival included a statement that reservations are required. No one asked if we had firearms. The civilian gate guard was friendly and courteous and was the only person from the base we met. We like out of the way places with few people so for us it was a wonderful campground. We thoroughly enjoyed our night on the lake and will try to stop again any time we need a campground in this area. Well worth the stop, especially at $0 per night. It takes a little coordination, and if you're a drop-in after normal duty hours or the weekend, you won't get a spot with power until the next duty day. We stayed there for one Friday night the weekend before the 4th of July and all the neighboring campgrounds, including Offut AFB FamCamp, were full. We took a chance at Ashland to see what was there and were the only campers there. We enjoyed it immensely even without electric service. According to the gate guard (very friendly and helpful), billeting runs the campground and they had left for the day. Great view, quiet, with a flock of visiting geese. Really nothing provided at the campground to do but that was fine with us. 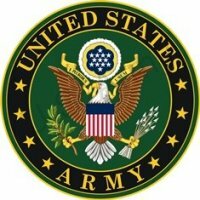 No facilities on the installation (BX/PX, Commissary, etc). The entire base is well groomed and taken care of. The scrap pile in the photo section is gone. 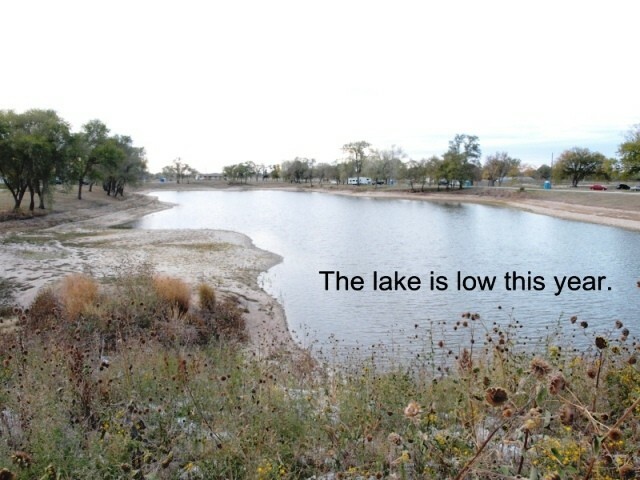 The lake was experiencing an algae bloom at the time and was closed to swimming. This is almost, but not quite, a bare-bones campground. 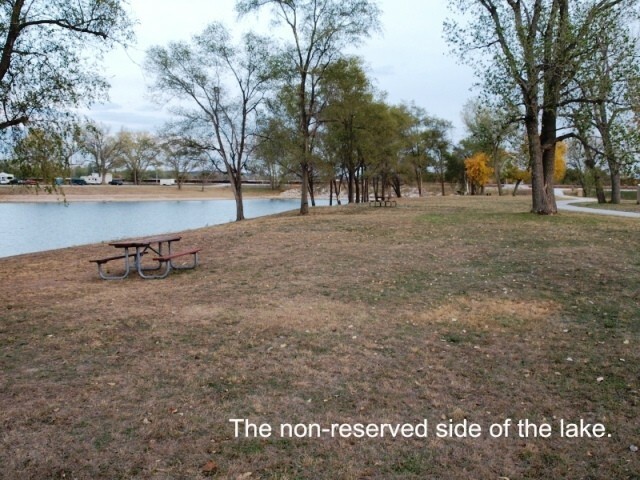 If you don't call in advance to arrange for a site, you will be camping on the side of the lake where there are no services. The parking spots on this side have twin concrete slabs about three feet wide to provide a secure footing for your RV, but there is no electricity nor water on that side. There is no dump site for your holding tanks anywhere on the base. The campground does have a number of portable toilets for campers who aren't in an RV. The other side of the lake is available by prior arrangement. You must call to obtain a key to the site you will be using. I did not use this side, so I can't comment on the procedures. 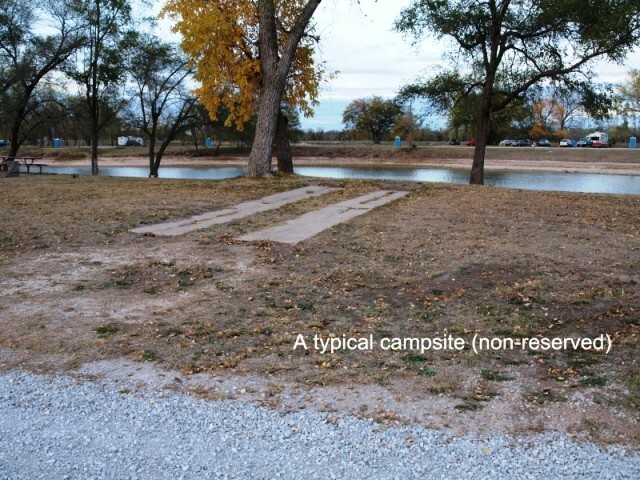 These sites also have a concrete slab for your RV, but at least some of them are about eight feet wide rather than the twin tracks provided on the non-reserved side. 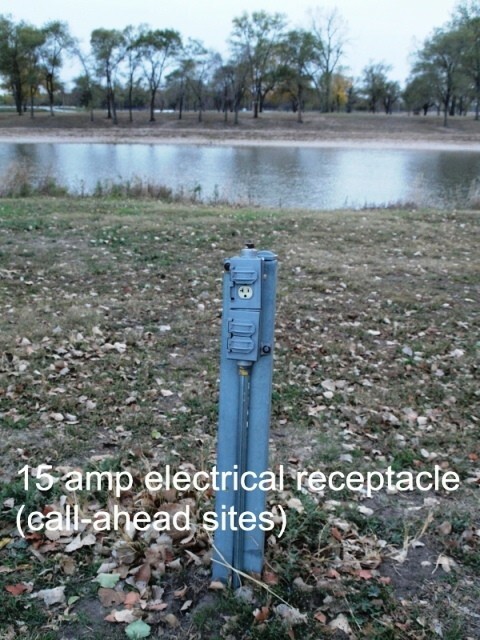 There are 15 amp electrical receptacles available at many, if not most, of the sites on this side of the lake. Some of these sites have fire rings or pits. Fires are not allowed elsewhere. There is one twin-faucet hose connection available to the lucky campers who get one of the sites adjacent to the faucet. The faucets were not the freeze-proof type and I suspect that the water is shut off to them during the coldest months. 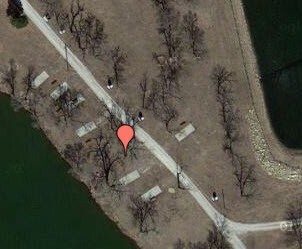 Many of the sites on both sides of the lake have a picnic table. At the entrance to the camping area is a large covered pavilion with lots of tables. I assume that this is available for use, but I'm sure that you must call and arrange for that. 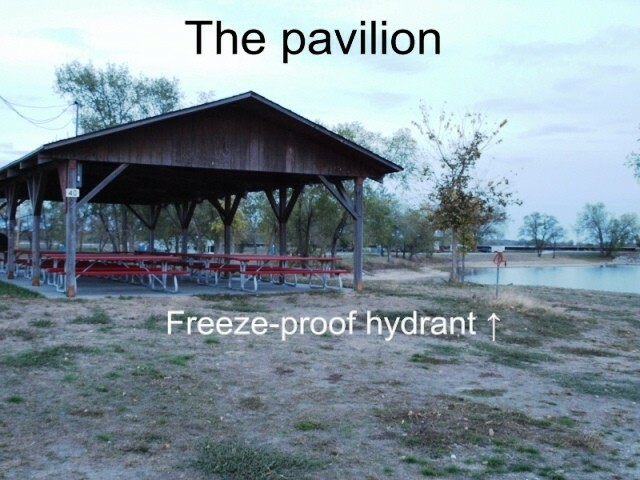 Next to the covered pavilion is a single, freeze-proof hydrant. I didn't use it, but would guess that this is the only location where you can get water year round. There aren't any playgrounds for children, but some of the campers' kids were playing happily on a pile of broken concrete that was nearby. I have done the same when I was younger and don't have a problem with that, but more careful parents may not want their kids playing where they could be seriously hurt if they fall. The camping sites surround a small lake which was very low when I stayed. It looked like it would be very nice during non-drought years. Swimming and boating (no powerboats) are allowed in the lake at your own risk. 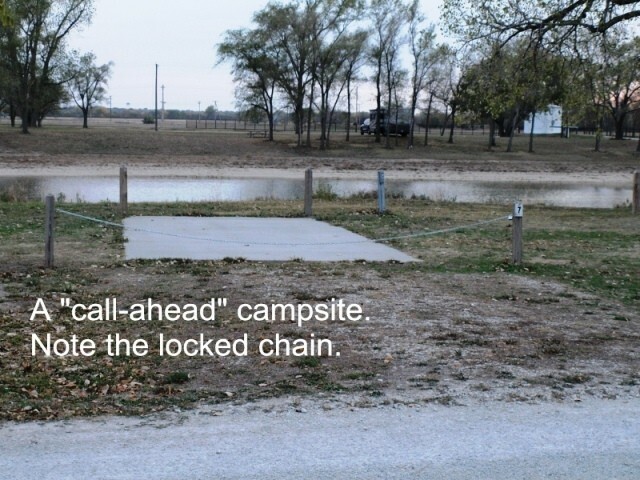 There is a fenced-off pond at the end of the campsite area. The sign reads "KEEP OUT - SEWAGE LAGOON". In spite of what you would assume there were no odors wafting towards any of us campers. The camp guardhouse is staffed by civilian employees who were friendly and courteous when I came by. The few other campers in the campground were exactly what I would expect from my fellow Midwesterners, friendly, outgoing, and helpful. The camp is only ten miles or so from the Strategic Air & Space Museum. That museum is certainly worth several hours of your time, even if you're not an airplane nut like I am. That museum is open every day except Easter, Thanksgiving, Christmas, and New Year's Day. Admission is $12 for adults as of October 2012. The contact number is 402-944-3100. The price for camping was certainly right, no charge at all for a site without services. I don't know if there is a charge for using the sites with electricity. Anyone with a valid military ID card or Nebraska state military department employees may stay at Camp Ashland. The maximum stay is two weeks. As with most (all?) military bases, firearms, and even BB or pellet guns, are not allowed. Pets are allowed if they are on a leash and attended. It's a good idea to call the camp before arrival to ensure that your stay will not interfere or conflict with training. As you would expect, military training has priority over all other activities. I got the impression that sometimes trainees will camp in the campground during their stay at Camp Ashland. They may fill it up. According to the paperwork I received, the contact person for Camp Ashland Recreation Area is First Sergeant Richard D. Goodenberger at 402-309-7648. From my military experience, I wouldn't be surprised to learn that another person has assumed 1SG Goodenberger's duties by now.